Four people were killed yesterday in a helicopter crash at Hawaii Volcanoes National Park. 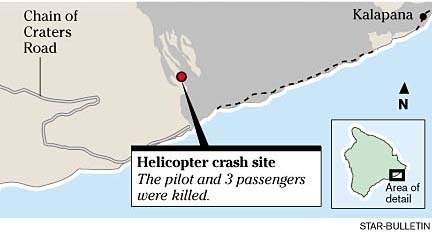 The pilot and three passengers were in a Hughes 500-D helicopter that crashed about two miles inland from the makai portion of Chain of Craters Road at about 9:48 a.m., said park spokesman Jim Gale. The crash site was at about the 600-foot level of Kilauea Volcano in an area known as Pulama Pali, Gale said. The chopper was operated by Tropical Helicopters out of Hilo. An investigator from the National Transportation Safety Board's Los Angeles office and two Federal Aviation Administration inspectors from Honolulu are expected to examine the crash site this morning. Tweet Coleman, FAA Pacific representative, said the investigators will look into the pilot's records, the helicopter's records and weather conditions at the time of the crash. Investigators from McDonnell Douglas Helicopter Co., the chopper's manufacturer, and Rolls-Royce, the company that built the helicopter's engine, are also expected to inspect the site. "The pilot reported a mayday" just before he went down, Coleman said. "Another aircraft operator in the area picked it up." She said the pilot reported engine problems before crashing. Coleman said the pilot was familiar with the area and had worked with another company prior to Tropical Helicopters. Gale said the eruption site beyond the end of Chain of Craters Road was closed after the crash and is expected to remain closed today. Identification of the victims is being withheld pending notification of family members. Park service crews recovered the bodies, which were transported by a private company to the Hilo morgue, said supervising park ranger Gail Minami, who served as incident commander. Minami could not say what weather conditions were like at the scene of the crash. She said the weather in the park can vary dramatically even within a half-mile. The accident occurred two miles mauka from where lava has been entering the ocean, Minami said. Depending on the size of the steam plume and wind conditions, vog could have affected those aboard the helicopter, Minami said. "If it was a big plume and the wind was blowing directly on shore, then it might have had a big impact on air quality," Minami said. "It could be a factor." She recalled that the last aircraft accident in the park was four years ago. Ten people died in the crash of a Big Island Air Piper Navajo Chieftain plane on Sept. 25, 1999, at the 10,200-foot elevation on Mauna Loa. "The park has had some pretty horrific accidents here," Minami said. Statewide, Coleman said there had not been a helicopter crash involving tourists for three years. The last fatal sightseeing helicopter crash was July 2000 on Maui, in which all seven aboard were killed, including a New Jersey family of four and two 14-year-old Texas girls. HILO >> Tropical Helicopters, which suffered an accident yesterday in Hawaii Volcanoes National Park, had another nonfatal accident outside the park in 2001. A Bell 206 JetRanger carrying a pilot and four passengers made an emergency landing in a field near Keaau south of Hilo on Sept. 28, 2001. The chopper was about five minutes' flying time from Hilo airport, heading for the lava-viewing area when a noise was heard at the rear of the aircraft and the cabin filled with smoke. The $250,000 aircraft was destroyed by fire, but only one injury resulted, a scrape on the head of a passenger who refused treatment. The remote area of Kilauea's eruptions, in a roadless area 10 miles east of the summit, makes helicopters the vehicle of choice for seeing the spectacle. With increased helicopter use have come accidents in Hawaii Volcanoes National Park. 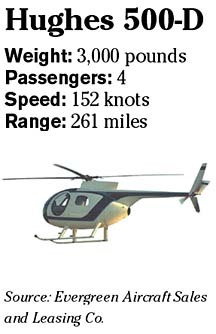 >> September 1992: A Kainoa Aviation helicopter crash-landed near Puu Oo volcanic vent. Three people walked away with minor injuries. >> Nov. 21, 1992: A Bell JetRanger flown by Hilo Bay Air crash-landed inside Puu Oo while filming a Hollywood movie. One passenger climbed out of the crater. Another passenger and the pilot were rescued by a second helicopter. >> Jan. 25, 1993: A Hiller HF1100 flown by Kainoa Aviation ditched in the ocean off the national park lava flow area, killing four, including Taiwanese actress Wang Yu-ling, 28. Pilot Robert Ervin survived.